This project aims to provide a free set of calibration patterns for high definition (HD) video players. You will find downloads here to create discs for Blu-ray and AVCHD players, a version with MP4 video for computers or other compatible devices, and a Patterns Manual with some basic instructions. Users can burn the downloads to DVD media for some applications, but all of the download versions are intended only for HD players. These calibration patterns will not play on standard DVD players, and they are not expected to calibrate for Rec. 601 video used in commercial DVDs. The AVS HD 709 patterns are meant only to calibrate for Rec. 709 encoded HD video, such as commercial Blu-rays. Primarily we intend to offer HD video patterns for calibrating digital displays, such as current LCD, LED, Plasma, and DLP models. This project does not address analog display (CRT) or audio calibration, which can be found on other sources such as Digital Video Essentials or Avia. The patterns provided have been divided into sections for different tasks. The Blu-ray related discs allow you to select sections from menus, and you can navigate the video clips in each section by chapter skipping. The Basic Settings and Miscellaneous Patterns primarily focus on setting user controls for your electronics with no test equipment, except possibly a color filter. The HDTV Calibration video by HD Nation in the HDMV and AVCHD versions can give new users some information on the most common display settings, or the Related Links can take MP4 users to the online episodes. The remaining sections are meant for taking measurements from the display, with a colorimeter or spectroradiometer, using software like ColorHCFR, CalMAN, or ChromaPure. Further details for using the downloads to calibrate your digital display are covered in the Patterns Manual, and everyone is encouraged to download a copy of the basic instructions for using the patterns. Directly below you will find the project downloads. The HDMV and AVCHD versions are intended for playback on Blu-ray players, the MP4 version is compatible with many HD media players, and a Patterns Manual is included with recommendations for using the patterns. Following the downloads an area titled Steps To Use The Downloads explains the general process to create a playable disc. A more specific procedure is given under Example For Windows Computers to create a disc for Blu-ray players. The Download Notes area simply includes some additional details, such as general system requirements and troubleshooting information. For anyone that wants to create a disc for a Blu-ray player, you may want to start with the Blu-ray Players List at the end of this post, to determine if you should download the HDMV or AVCHD version. Plays on: Most Blu-ray players from BD-RE or BD-R media. See the Blu-ray Players List at the end of this post for more information on compatibility. Burn to: BD-RE or BD-R media with a Blu-ray burner. Note: This is a Blu-ray format, and it is primarily intended for BD-RE or BD-R media. If you only have access to a DVD burner, please check your player for AVCHD compatibility first. Some Blu-ray players do not support AVCHD and can play this version if burned to DVD media with a DVD burner, which will be listed as the DVDM option in the Blu-ray Players List. Includes: All content and features available from AVS HD 709, as shown in the Patterns Manual. Plays on: Many AVCHD compatible Blu-ray players. The Blu-ray Players List at the end of this post includes more information to determine if your Blu-ray player supports this download. Burn to: DVD writable media with a DVD burner. Note: When using DVD media some players will only be able to play either the AVCHD or HDMV, and the other version will not work from DVD media. For example the PS3 can only play the AVCHD from DVD media, and some Samsung models also only play one version version from DVD media. Technically the AVCHD includes extended information and omits the AUXDATA, BDJO, JAR, and CERTIFICATE folders, which can affect playback from DVD media on some players. Includes: Most content available from AVS HD 709. Refer to the Patterns Manual for more information. Not Included: Some Misc. Patterns, such as the Mpeg2 video from dr1394, and the top navigation selections from the HDMV menus. Plays on: Many MPEG-4 AVC or H.264 video players. For example computer video players, or the Xbox 360 after an online update. See the player specifications for types of video supported. Media: Depends on player, for example the Xbox 360 can play files from DVD media. Includes: Individual AVC video test clips in an MP4 container. Limitations are listed in the next line, and the Patterns Manual includes further details. Not Included: Menus and navigation features, the HDTV Calibration video from HD Nation (see Related Links), or Misc. Patterns Mpeg2 video from dr1394. Note: Regardless which of the above versions you choose, please download the PDF document for general information about the patterns and recommendations on how to use the video sections. If you require further information about taking measurements, please see the documentation for the software you are using or refer to the Related Links area of this post. The pictures included in the Patterns Manual come from the HDMV version, and the AVCHD or MP4 version will not include a few features as commented above with the downloads. 1) Choose a version: Decide on either the HDMV, AVCHD, or MP4 version depending on what HD player you want to use. HDMV will be compatible with the largest number of Blu-ray players if burned to BD-RE or BD-R media, so if you have access to a Blu-ray burner typically you would choose the HDMV version. There are many Blu-ray players today that are AVCHD compatible, so for people that want to calibrate from a Blu-ray player and only have a DVD burner the AVCHD would often be the version to choose. Burning HDMV to DVD media will not be as widely compatible as either of the prior choices, but if you only have access to a DVD burner it may work for a few Blu-ray players that are not AVCHD compatible. The Blu-ray Players List at the end of this post gives more information on how to select a version for your Blu-ray player. The MP4 version is intended for applications other than calibration with a Blu-ray player, such as some digital media players that can play AVC video. In any case your player must be able to play true high definition video, such as a Blu-ray or HD media player. None of the versions will work on standard DVD players, or upconverting DVD players, because those players cannot play actual HD video. 2) Download a compressed file and manual: Select either the .exe or .7z file to download, according to the computer operating system you are using. The .exe will work on Windows. The .7z is not system-specific, so it will work with Windows, Linux, or Mac with additional software. The HDMV or AVCHD can usually be downloaded with web browsers. Using a download manager that supports resuming (like Orbit Downloader) is another option to make sure you receive a complete file, and a download manager may also provide the fastest possible download speed. The downloads will take some time to finish, especially the HDMV or AVCHD version. How long the downloads take will depend on various factors, but a 6 Mbps connection might take at least 15 minutes. At this time, please also download the Patterns Manual, for some basic details on how to use the patterns. 3) Decompress the download: If you downloaded the .exe, Windows should decompress the file by double-clicking on it. There have been a few reports of the .exe failing to work, so if the .exe happens to fail on your Windows system you might instead try the .7z version. For the .7z, you will also need the free 7-zip software to decompress or extract the file. Here is a description for Mac, or Rucksack was also suggested for .7z decompression on Mac. The decompressed HDMV or AVCHD file requires approximately 4.4 GB of free space on a modern file system (See Download Note A). The MP4 download will decompress to video files and folders. If you happen to run into issues with this step, it could be due to an incomplete download, so please refer to Download Note B. 4) Burn a disc: The HDMV or AVCHD requires you to burn a disc after decompressing the downloaded file. This step does not necessarily apply to the MP4 version, but for the Xbox 360 you can simply burn the files to a writable DVD. The AVCHD version is intended to be burned to DVD media with a DVD burner. HDMV is intended to be burned to BD-RE or BD-R with a Blu-ray burner, but there are a few players that are not AVCHD compatible and can play HDMV if burned to DVD media with a DVD burner (DVDM option). 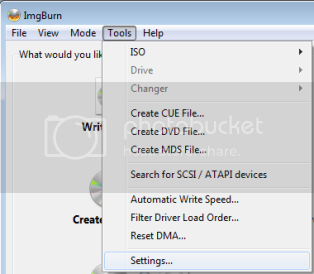 Our recommendation is to use ImgBurn as shown below in the Example For Windows Computers for burning .iso files to disc. Windows Vista Service Pack 2 and Windows 7 or 8 also allow you to burn an .iso file to disc by right-clicking on the file from Windows Explorer, or this link gives step by step instructions for burning an .iso image with a number of Windows programs. On Mac an .iso can be burned directly from the disc utility application. The following procedure shows how to apply the prior steps for a computer running Windows. You can follow this example to create any of the HDMV, AVCHD, or DVDM options shown in the Blu-ray Players List. 1) Choosing a version: You may want to refer to the Blu-ray Players List at the end of this post to find which version your player likely supports. Consulting the specifications or manual for the Blu-ray player is another way to determine what version the device may play. Many newer Blu-ray players will list AVCHD support in their manual or specifications, and HDMV compatibility would generally be indicated if the player lists BD-RE or BD-R playback. For the AVCHD version you will need writable DVD media and a DVD burner. The HDMV version is primarily intended to be burned to BD-RE or BD-R media with a Blu-ray burner, but some players can play HDMV burned to DVD media with a DVD burner (DVDM option). For this example, let's say you own a PS3 and only have access to a DVD burner. Judging by the Blu-ray Players List the PS3 supports the AVCHD version, so in this example we will show how to create an AVCHD version disc that will play on the PS3. 2) Downloading a compressed file and manual: If your computer is running Windows, you can likely use the .exe download. Since the AVCHD version has been selected for this example, the AVCHD (.exe) link above in the Downloads area would allow you to begin downloading the compressed file. Usually a web browser will work for downloading, but if you encounter issues you may need to use software intended for downloading large files. Using a download manager that supports resuming (like Orbit Downloader) is one option to make sure you receive a complete file, and a download manager may also provide the fastest possible download speed. The downloads will take some time to finish, for example a 6 Mbps connection might take at least 15 minutes. At this time you should also download the Patterns Manual, to have some basic instructions for the disc. 3) Decompressing the download: Once you have downloaded the file for the option you selected, just double-click on it and you should get a window asking where to extract the file. Choose a location by clicking on the "..." button at the right, or using the written path displayed in the window (such as C:\\ in the image below). The location you choose requires a modern file system and must have about 4.4 GB of free space (See Download Note A). Once you have chosen a location, click the extract button. When the program is done decompressing, you will have a large .iso file in the directory you selected. If you are not presented with the following window after double-clicking on the .exe file, refer to Download Note B. 4) Burning a disc: We will use ImgBurn to create a disc in this example. On opening the program choose the Tools menu and go to Settings. 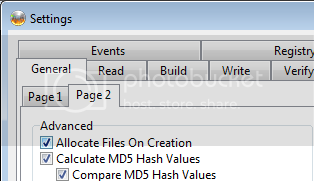 Switch to Page 2 and add check marks to Calculate MD5 Hash Values and Compare MD5 Hash Values. Press ok after making the settings changes to return to the main screen, and select the Write image file to disc option. Next under Source, click on the left yellow folder, and then select the .iso file from step 3. Once you insert writable media in your burner, the program is ready to create the disc. Click the button in the bottom left, and the program will burn the image to disc. This will take some time to complete. When ImgBurn finishes burning and checking the disc, review the ImgBurn Log for the Device MD5 and Image MD5. If the values match with the Iso MD5 listed for the version you downloaded, then the download, decompression, and burn were all successful. If the values from ImgBurn do not match those listed for the download files, then some part of the process may have encountered issues and you might want to try downloading again. If you plan to use ImgBurn for other tasks, you may want to uncheck the Calculate MD5 Hash Values and Compare MD5 Hash Values settings. A) The HDMV or AVCHD download will decompress to a file about 4.4 GB in size. Recent versions of Windows, Linux, and Mac all use default file systems that will work for decompression. FAT32 formatted hard disks do not work for decompression, because FAT32 has a smaller file size limit. In Windows Explorer you can right-click on a hard disk and select properties to see the file system. If your hard disks have been formatted as FAT32 you will need another location for the decompressed file. Flash media drives of 8 GB or larger will work for decompression, when formatted to a modern file system such as NTFS, HFS+, or ext2. If you have more than one optical disc drive, another option would be decompressing to DVD media. B) In order for the .exe or .7z decompression to work, you must download the entire file. Using software intended for large file downloads may help, if you have issues using a web browser. One of the many download managers that support resuming downloads is a way to make sure you receive the complete file, and a download manager may also provide the fastest speed available for your current connection. If you live in the United States many public libraries provide high speed internet access suitable for downloading. Directly below the file sizes for the HDMV and AVCHD downloads are listed. You can use these sizes to check if you have downloaded the entire file. For example, in Windows Explorer if you right-click on a file and go to properties the size listed in bytes should match the following values. C) If a disc would happen to be unable to play on an HD player that other people are able to use, our typical method of troubleshooting would be first to check that the player's firmware is current, make sure you have selected an appropriate version for your player, and then to try to eliminate disc or computer problems. Common suggestions would be to try a different disc type or brand, burn at a slower speed, or try burning from a different computer. You might also want to check the MD5 hash from the uncompressed .iso file or burned disc. If none of this helps and you would like further feedback on playback problems please list which version you downloaded, the software you are using for burning, and your HD player model. D) MD5 Hashes can be used to check the integrity of the decompressed .iso file for HDMV and AVCHD versions. MD5summer is an example of a Windows program that can be used to create an MD5 sum. Some software solutions, such as ImgBurn, will also be able to provide an MD5 comparison for a burned disc. A description for using ImgBurn to check MD5 Hashes on a newly burned disc is included in the Example For Windows Computers. E) Because of the UDF format used for HDMV and AVCHD versions, some computer operating systems like Windows XP will not be able to read a burned disc. The only thing that matters is if a compatible HD player can read the disc. Please do not consider a disc unplayable unless a Blu-ray player can not play it. Even if a computer cannot read the HDMV, AVCHD, or DVDM disc, a Blu-ray player may still be able to read the disc. F) BD-R LTH Type media is not recommended for HDMV burning, unless you know that the equipment you use supports the discs. This Wikipedia entry reports the PS3 as able to read the discs, but generally BD-R LTH Type discs are not recommended due to possible compatibility issues with some Blu-ray players or burners. G) LZMA (7-zip) compression is used instead of a more common format like .zip due to efficiency. During testing the download files have been substantially smaller using 7-zip for compression. 1) While the majority of recent Blu-ray players can play at least one version, not every Blu-ray player will be able to play the downloads. The only way to support all Blu-ray players would be through Blu-ray replication, and the fees are prohibitive for the original purpose of this project. 2) No patterns are included for items such as audio synchronization, motion resolution, noise reduction, or 50% and 25% colors. At this time no further revisions are planned, yet users may contribute items to the project they consider possibly useful additions. 3) Panasonic players using the AVCHD version may find that the HDTV Calibration video lacks chapter skips and a popup menu. The top menu button on the remote should still return to the main menu, and fast forward or rewind should be able to move through the HDTV Calibration video. Some Panasonic players have been reported to be unable to output the AVCHD as 24p video. At the current time we are not aware of an alternate AVCHD authoring method to solve these reported issues on Panasonic players. The HDMV version burned to BD-RE or BD-R with a Blu-ray burner should include the chapter skips and a popup menu and be able to output 24p on the same Panasonic players. 4) TotalMedia Theatre 5.0.1.80 (November 17, 2010) cannot play the HDMV or AVCHD discs. TotalMedia Theatre 5.0.1.86 has been reported to correct the issue, and it can play the HDMV or AVCHD discs. TotalMedia Theatre 6.0.1.119 was able to play the AVCHD or HDMV from disc, but it was unable to play virtually mounted discs. TotalMeida Theatre has generally been capable of playing the HDMV image mounted with the latest version of Virtual CloneDrive, and some versions of the program can also play the HDMV folders from a hard disk. - Will AVS HD 709 play on the Xbox 360? - How do I set a Playstation 3 to output standard video levels? - Can I use this disc for adjusting controls that affect the shade of gray, such as white balance, gain, offset, or bias? - Why might other calibration patterns, like Digital Video Essentials, result in a different brightness setting on some displays? - How does video usually play back on a computer? - Will there be a future version with small windows for plasma measurements? - I would like some different patterns. How do I create my own calibration disc? The AVS HD 709 patterns are offered free for personal use. As the authors, hwjohn and myself request any redistribution to retain the credits, which are included in the menus or as a text file in the MP4 version. This project started from input by dr1394 (W6RZ.net), including the program used to convert images. We would like to thank 3no, dr1394, GetGray (calibrate.tv), Imatest.com, J. Vincent, and WalVisions.com for allowing us to include their patterns. We appreciate Mathias Mahling (chokemaniac.net) for providing the original logo design. Thank you to Revision3 and HD Nation for allowing us to include the HDTV Calibration video. Thanks to Hank315 (HC Encoder) for the help, including a special build that was used for HD DVD Mpeg-2 encoding. Credit also goes to kchung for the original disc label layout. Some software that proved valuable includes 7-Zip, AVIsynth, BDedit, ImgBurn, MeGUI, multiAVCHD, and x264. Caramella font from dafont.com has been used in the project. Also thank you to the creators of ColorHCFR for the free calibration program that got the project started, CalMAN and ChromaPure for incentive to continue making changes, the AVS Forum for making the project possible, everyone that supplied feedback, and certainly the numerous others we tried to learn from in the process. If you would like to contribute to AVS HD 709, please support one of the projects that have helped us. Information specific to different Blu-ray player models will be listed below. Any players not listed simply indicates no one has replied about the player, and it is newer than the models available when the list was first compiled. Newer Blu-ray players can usually play HDMV burned to BD-RE or BD-R with a Blu-ray burner, and many current models are compatible with AVCHD. Only a few older model players are known to be unable to play any version, and the models are noted in the list. It is common for brands to often support similar playback across different models. If you purchase a newer player than the ones listed, you might first check to see what previous models have supported. For example we would expect newer Panasonic and Sony models to play HDMV or AVCHD based on support in previous models. If you have access to a Blu-ray burner, the first choice is typically to download the HDMV version and burn it to BD-RE or BD-R media. The choice of HDMV on BD-RE or BD-R will have the best compatibility with the largest number of players, and it includes all the features available from this project. You may want to avoid BD-R LTH Type media when burning the HDMV version, because BD-R LTH Type media could be incompatible with some Blu-ray burners or players. For anyone with access to a Blu-ray burner, most often the recommendation is to burn the HDMV to BD-RE or BD-R media, but you may want to check the list below first for further information. If you only have access to a DVD burner the choice becomes more complicated, because manufacturers do not all agree on a common format for HD video on DVD media. Many current players are AVCHD compatible and will play the AVCHD download, while other players do not support AVCHD and they may play HDMV from DVD media (DVDM listing). Typically players that support AVCHD will list compatibility somewhere in the manual, specifications, or they may even show the AVCHD logo on the player. The AVCHD version burned to DVD media is widely accepted by many newer players, and it will generally be compatible with the largest number of Blu-ray players when using DVD media. Primarily the DVDM option listed below is intended for DVD media playback when AVCHD is not supported by the player, such as some Denon and Magnavox models. For anyone that only has access to a DVD burner, the typical recommendation is to first check if the player can play AVCHD, yet the list below also includes an option for HDMV on DVD media (DVDM listing) and feedback from other users. HDMV - Indicates the HDMV version burned to BD-RE or BD-R media with a Blu-ray burner should play. Typically HDMV on BD-RE or BD-R will be compatible with more players than any other version. AVCHD - Indicates the AVCHD version burned to DVD media with a DVD burner should play. Overall AVCHD will be compatible with the largest number of players when using DVD media. DVDM - Indicates the HDMV version burned to DVD media with a DVD burner should play. Some players lacking AVCHD support can use HDMV on DVD media, such as certain Denon, Magnavox, and Insignia models. A question mark (?) below indicates the version might play, but currently no one has tested the player and replied. If a version name is missing for the model number, then the player has been reported as unable to play the version. Notes are provided for any additional comments about the player. If you test a Blu-ray player and have information to add, please reply so the list can be updated for other users. Don Landis, CZ Eddie, Webmonkey and 21 others like this. Last edited by alluringreality; 03-06-2019 at 08:17 AM. Some quick comments to add to alluringreality's excellent post. Although this disk is considered to still be in Beta, the test patterns have been thoroughly checked for accuracy. If you have questions about how they were verified, feel free to ask. The issues with QuEnc encoding should have no impact on the accuracy of the patterns. For those of you who may be interested in submitting patterns to be added to the disk, they must be submitted in 24 bit Targa (.tga) format, 1920x1080 pixels. All that is required to submit a stationary pattern, such as a sharpness pattern, is a single .tga image. Please follow the guidelines that alluringreality has set forth before posting any patterns to the thread. I hope that the AVS community will find this disc helpful. I know that these forums have helped me tremendously, so this is our attempt to give back. My sincere thanks goes out to everyone who helped us along the way. 3. File hosting might become a problem if people would happen to find the disk(s) useful. If you're able to host or mirror the file, or if you're aware of alternate hosts that could be used, again we would welcome that sort of contribution. While this was meant for the HCFR crowd, we can host a mirror in so long as the bandwidth does not get to be too outrageous. Send me a link to an FTP site, and we can put it in our support forum or on our website proper. I promise to be relatively discreet in pointing out the obvious relationship between free and a lack of resources for hosting. This is one of my favorite forums because of the community participation. My hats off to you guys for your contributions in helping us grasp a basic understanding of the concepts of calibration and giving us the tools to fiddle with this stuff. For a lot of us this is just a hobby, for others it's your bread and butter and this type of exposure leads to a greater appreciation for the layman. Hey, there's more to calibration than brightness and contrast settings and after puttzing around with our own cals, us hobbyists have a greater appreciation of the value of a full professional calibration being done for us. g-man5.1, qwho51 and starmajoris like this. Thanks a ton for the offer. About the only thing that is really geared toward HCFR is the order of the patterns. I haven't used CalMAN, but I know it is a great program as well and I think the disc would be useful for it as well, even if it isn't as easy to navigate. Right now alluringreality is working on some final things to get the upload going. I'm not 100% sure what his timeline is, but I think he should have something within a day or two. You just need a place to download the file, correct? Once the ISO is done, I can give you ftp access to the server that we use to go back and forth on, or you can download it from the "temporary" hosting that is provided in the link. Just let me know, and thanks again. alluringreality and I are just hobbyists as well, but we have had a lot of help on the disc from professionals such as dr1934. We did this because we recognized a lack of HD calibrating materials (especially for free), and we are into tinkering ourselves. We hope that all of the DIY'ers (and ISF'ers as well if they want to use it) find our work useful. Thanks for the comments. First off, major thanks to all those that are involved in this. I don't see it explicitly mentioned, but has the disc been verified to work with the Xbox 360 player? If not and you need a tester, l can help as I also use HCFR. Not to stop the presses, but if you could do a second ordering of the Primary/secondary patterns, we/our users would appreciate it. We do: White, Red, Green, Blue, Cyan, Magenta, and 100% White. Yes, I just need access to an HTTP or FTP location where I can download it, and then I will push it onto our server where we have a bit more bandwidth. The HD DVD is up on Sendspace and a Filesend copy might follow. Thanks for the offer to provide a download link. At this time I'm not sure if it's absolutely necessary, but so far in our testing the Blu-ray hasn't been as compressible. Honestly the easiest thing would be to make another disk for use with CalMAN. From my side it's not a huge issue but hwjohn would have to recode the two color sections with the different order, so it's his call. From my perspective a direct link would be worth supporting two same-format disks as long as they're mostly similar. This might be something that we put off until we get some feedback on if there are any problems with the disk. The top menu will have to surely be changed at some point and to me putting out another disk at that time wouldn't be much of an issue. I just didn't think it was worth redoing the image and ISO for the menu at this time. One of the things I found most frustrating about HCFR is that yellow seems out of order to most disks, so I think that's what you were intending. Because I'm familiar with HCFR is the only reson it's referenced. I thought I might try Calman if there was a v3 trial as I read might happen, but generally someone else would have to be very exact on what would work for a somewhat-logical layout. One of the issues with the way Media Factory works is that you cannot chapter-skip back to a previous title. We will talk it over. I don't have a problem with it, I just want to discuss with alluringreality as to what is the best route to get it worked in. Take a look through the disk contents and the disk itself if you have a player, and let us know 1) what you think of it overall and 2) what would need to be changed in order to provide maximum compatibility with CalMan. I was able to download the iso, burn it using imageburn and play it back successfully on my A2. I don't have much time to spend with it now but will report back when I do. Download and burned the iso. I just did a quick navigation through the patterns on my Xbox 360 HD-DVD drive and it works perfectly. EDIT: Holy cow was the banding on the greyscale ramps bad on my 360! Fixed now thanks to this disk. Great, thanks for testing it. We need all the feedback we can get at this stage. Wow this forum is great - got a new A2020 to go with my A2 and now even more tweaks. I downloaded the iso and burned it with DVD Decrypter. The disc works great using the 360 add on. I have a Sony 70" XBR2 SXRD and it turns out that I had to move my sub picture 2 notches because I was clipping white at 233. I haven't rechecked my grayscale with it yet, but I will because it's been a few hundred hours on the lamp and a cross country move since I did it last. I navigated the whole disc and it seems to be working great in that respect. EXCELLENT WORK! Thank you so much for making this available to us all. I dream of a better tomorrow... where chickens can cross roads and not have their motives questioned. Just gave it my first run through with Color HCFR. I love it! Previously used HD DVD and needed to jump to different menus and colors were out of order. Now everything I need is all consecutive patterns, perfect. Nice work and thanks for providing this!!!! After private discussion, currently we are going to put off making a decision on whether or not we might choose to directly support CalMAN at some point in the future. Due to the disk layout, most likely the request would require two versions, which would eventually turn into four versions. That's a trend we would prefer to avoid. In order to retain our original goal of having a single disk for each HD format with an elegant layout for HCFR use, I suggest that alternately CalMAN might add an option within their software at some point to work with the disk. We welcome feedback on this issue for any other ideas, within the capabilities of what Movie Factory 6+ Power Pack offers, which might support both programs and remain easy to use. We were able to come up with one alternative that might better serve the interests of everyone involved. The idea was that we could open up to the idea of supporting the additional versions if CalMAN users or designers could be able to help us get to our goal of having a quality pattern for setting sharpness, observing overscan, and adjusting centering as described in the known issues of the original post. If CalMAN staff would have this capability exclusively, then I think we would be open to creating a second disk that might best serve their users in exchange for allowing us to include it on our current disk which is geared more toward general users and HCFR. If anyone has alternate ideas or disapproves you're welcome to express your thoughts, but after discussion I do think that it's beyond our original scope when we still have unfinished items remaining. Our current opinion is that either direct help on the disk or leaving it as a single version for each HD type is the best option. At this point we consider the disk to be a beta version that could certainly change, and we would appreciate any responses from anyone trying the disk, including CalMAN users. Our next goal would probably be to get a similar AVCHD disk put together, and so that will likely be my major focus until there's more feedback on the HD DVD. Again we welcome any offers to help us add to the disk, but largely this has merely been a result of our wanting a disk of this type and simply opening it up to others for that same personal use. THANK YOU!! I have been using dr1394's patterns (and thank you for that!) but the lack of grey windows was bothersome. Your hard work here is most appreciated! dr1934 actually contributed a great deal to this project as well. It is really an extension of his work, just in a somewhat more user friendly format. Glad you enjoy it. OK, so I spent a couple of hours this morning actually using the disc to calibrate my plasma. I'm very happy with the results. The lack of backwards title navigation wasn't really an issue to since the menu system works pretty well. It took me a couple of minutes to get used to which title is selected. Highlighting the title box by surrounding it with orange in the same way the chapters are highlighted would be an improvement. Not sure how easy this is. As for the patterns themselves, there were more than enough for me. All the ones I needed were there plus a few extra ones that I played with. If I were to make one suggestion it would be to add dedicated full screen greyscale ramps and bars in addition to the one in Title 8, chap 1. Depending on how the displays menu system comes up having more of the screen dedicated to the ramp/bars would be helpful. The menu system is from Media Factory. There are some things I don't like about it, but I like that option better than the other choices available. So the menu I will say is beyond our control. As for the full screen bars and ramps, one pattern for each, I think that is a reasonable request that shouldn't be too much work to add. We are going to probably give it a couple weeks before considering revising the disk, but I think that's doable. I figure having maybe twice the number of patterns that are in the Misc section right now is reasonable. So we will certainly take the suggestion into consideration. great work. Thanks for all your hard work. This is extremely useful as I want to do something similar. I would like to see some other patterns to help with setting up the colors as I don't have a color meter. Excellent jobs guys. Thanks. I do not hit--it hits all by itself." The "Color decoder flashing pattern" is about the most that can be shown for color without a meter. The idea is similar to "DVE and colors" or page 33 here. The difference is that on the pattern with this disk the corresponding colors are grouped. When you look through the blue filter you'll be looking at the flashing blue bar, use the red filter to look at the red bar, and green filter with green bar. Looking through the blue filter for example, ideally you would see no flashing on the blue bar. The idea is that in a perfect setup there will be the same amount of blue in the blue, gray, cyan, and magenta. If you look at the DVE pattern you'll see that the area they show being blue through the blue filter is blue, gray, cyan, magenta. The last three are the stripes which flash on top of the blue bar. The other bars are grouped similarly. For example the red bar has gray and the two secondary colors. Red, gray, yellow, magenta all contain red. Again in a perfect setup you wouldn't be able to see much flashing through the red filter when looking at the red bar because you would want the levels to match. Realistically you'll probably always see some bit of difference between the flashing colors on the bar you're looking at through the corresponding filter, because there's only so much that can be done with the user color and tint controls. The easiest control to watch work will probably be color. With color you'll almost certainly see the flashing gray change in relation to the bar. Basic Settings chapter 4 (Flashing color bars) explains how to use color so that blue matches gray. You can do the same for red and green, but each might have a little different color setting. I never figured out how to really set tint with the DVE pattern, but you should see that the flashing colors other than gray on each bar will change when you change the tint control. Most likely with only color and tint controls each filter will not be able to be set perfectly, so the idea is just to get the flashing stripes on each bar to most closely match the bar. Basically try to reduce the flashing and get them to as close a shade as possible. Title 8, chapter 2 is about the most that can be shown for color without a meter. The idea is similar to "DVE and colors" at http://www.ramelectronics.net/html/V...libration.html or page 33 from http://www.videoessentials.com/dvehd...gram_final.pdf The difference is that on the pattern with this disk the corresponding colors are grouped. When you look through the blue filter you'll be looking at the flashing blue bar, use the red filter to look at the red bar, and green filter with green bar. Realistically you'll probably always see some bit of difference between the flashing colors on the bar you're looking at through the corresponding filter, because there's only so much that can be done with the user color and tint controls. The easiest control to watch work will probably be color. With color you'll almost certainly see the flashing gray change in relation to the bar. Title 2 chapter 4 explains how to use color so that blue matches gray. You can do the same for red and green, but each might have a little different color setting. I never figured out how to really set tint with the DVE pattern, but you should see that the flashing colors other than gray on each bar will change when you change the tint control. Most likely with only color and tint controls each filter will not be able to be set perfectly, so the idea is just to get the flashing stripes on each bar to most closely match the bar. Basically try to reduce the flashing and get them to as close a shade as possible. Cool. Thank you for pointing it out. I got my colors very close to perfect. I had the saturation and tint a little high before. Now, everything looks great. Thanks. Realistically you'll probably always see some bit of difference between the flashing colors on the bar you're looking at through the corresponding filter, because there's only so much that can be done with the user color and tint controls. Not related to this thread but a great measurement would be to use your patterns on set that has a good CMS, set color using some standard filters to get them all dialed-in and then measure with a good probe. I've always been interested in just how good/bad the filter method is. There are two main difficulties with the filter method, the first is that it has a subjective component in matching intensities but with experience this could be quite small. The second larger problem is that filter passbands do not match the CIE x-bar,y-bar,z-bar functions so you are not calibrating to the right standard, that's the component that will have the larger error. Given the complexity of the z-bar function I would suspect that red will be the largest offender, followed by blue, and then green. My plasma (NEC) has a CMS system and after dialing in the primaries/secondaries to pretty much dead on (except for green) the flashing bars when looking through the red/green filters is off. The blue filter is actually the best and where it does work well is for setting saturation. I'm using a D2 with HCFR so the red problem may simply be due to the known issues with reds and plasmas although the NEC is supposed to have an extra red filter and the picture doesn't look too red after calibation either. It would be great if someone could make that comparison, but I don't think there is much we can do about it in terms of this disk. I think alluringreality did about the best job you can in terms of getting a good pattern. I always hated the SD Avia pattern because it has those little lines between the background and the patches. It makes it much more difficult because you can't see which patch actually blends with the background. This pattern should be much better than that I would expect. As far as the filters go... well, not much anyone can do about that. But if you don't have instrumentation, filters and a good pattern should get you a whole lot closer than eyeballing it. I don't know how much we can really do about that except double check the pattern, and it has already been triple checked for the most part. Could you quantify how far off it is? That may at least give users an idea of how far off the filter based method is (I would guess it would also vary from filter to filter). If it is off less than 5% or so, I would call that pretty darn good. In relation to our known issue #2 in the original post, do you think it would be beneficial to have a multiburst pattern? I'm just looking for some way that maybe the sharpness control could be set on a SXRD and also the negative effects of the 'enhancement' controls can be looked at. In my opinion both of those things seem to be able to be done with the 2nd pattern on the Sony Blu-rays (7669 enter at the menu) and I'm not sure that a multiburst would address all my concerns and offer an easy way for the average user to look at those controls. Not to mention, that I don't think our current system of going to video could be used.